Finding roots in Columbus' Easton Town Center, ShopLab pushes innovative thinking outside the box. With short-term leases and a suite of available services including visual merchandising support, digital signage and retail traffic analytics, retailers can experiment and test new concepts with out the commitment of permanent spaces. Partnering with Steiner + Associates for a successful launch, ZenGenius provided creative services including store design and development, fixture and display specification, graphic design, sourcing and procurement, visual merchandising and onsite installation support. Learn more about the current tenant, Rock ‘Em, a Sock Store. Be sure to check out our latest article in the November/December 2018 issue of STOrai Magazine from the Retail Association of India. 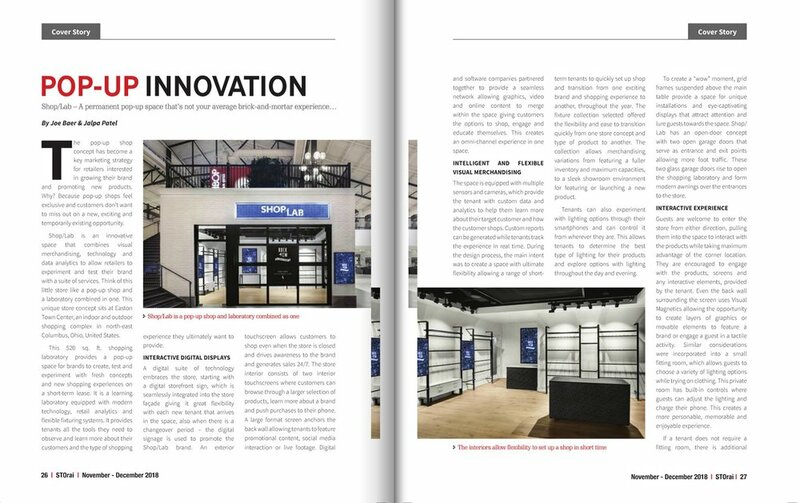 Pop-Up Innovation written by ZenGenius, Inc.’s very own CEO/Creative Director, Joe Baer and Senior Visual Merchandiser and Interior Architect, Jalpa Patel.